NASA's Dawn spacecraft took these images of dwarf planet Ceres from about 25,000 miles (40,000 kilometers) away on Feb. 25, 2015. The resolution is about 2.3 miles (3.7 kilometers) per pixel. A NASA probe will arrive at Ceres Friday morning to begin unraveling the many mysteries of the dwarf planet — including the puzzling bright spots that blaze on its cratered surface. NASA's Dawn spacecraft is scheduled to slip into orbit around Ceres — the largest object in the main asteroid belt between Mars and Jupiter — at 7:20 a.m. EST (1220 GMT) on Friday, March 6, wrapping up a deep-space chase that lasted two-and-a-half years. "It's clear that discoveries lie ahead, and Ceres will be revealed in stunning detail, just like Vesta," Dawn Deputy Principal Investigator Carol Raymond, of NASA's Jet Propulsion Laboratory in Pasadena, California, said during a news conference today (March 2). 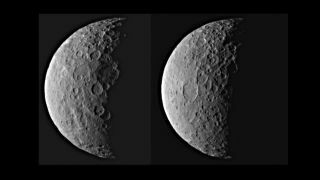 Raymond and her colleagues hope Dawn's observations will help them understand what generates Ceres' mysterious bright spots, two of which shine from within a 57-mile-wide (92 kilometers) crater on the dwarf planet's surface. "Suffice it to say, these spots were extremely surprising to the team, and they have been puzzling to the team and to everybody who's seen them," Raymond said. The spots indicate the presence of highly reflective material, perhaps ice or salts, she added. The probe will also hunt for signs of water vapor emanating from the surface of Ceres — an intriguing phenomenon first reported last year by researchers studying data gathered by Europe's Herschel Space Observatory. But Dawn's main tasks will involve mapping the dwarf planet's surface in detail and investigating its mineralogy and elemental composition. Ceres is covered with many craters, as seen in this mosaic comprised of images taken by NASA's Dawn spacecraft on Feb. 19, 2015 from a distance of nearly 29,000 miles (46,000 kilometers). One Ceres crater houses two mysterious bright spots, which scientists plan to investigate further. Both Ceres and Vesta — which are 590 miles (950 km) and 330 miles (530 km) wide, respectively — are planetary building blocks whose growth was stunted by Jupiter's powerful gravity. So Dawn's work should shed light on the planet-formation process and the conditions prevalent during the solar system's early days, NASA officials say. "'Dawn' is not an acronym, which is really unusual here at NASA," said Jim Green, director of the space agency's planetary-science division. "Dawn really refers to what the mission is all about, and that is going back in time — visiting the basic remnants of objects that come together to form our planets." Dawn has been using its superefficient ion engines to close in on Ceres gradually, and orbital arrival on Friday will require no dramatic engine burns, mission team members said. The big moment will occur when the probe is out of communication with Earth, so confirmation that Dawn is circling Ceres will probably not come until Friday afternoon. The probe won't begin its science work right away. Rather, Dawn will spend about six weeks spiraling down to its first science orbit, which will be reached on April 23. Dawn will then study Ceres from a series of orbits — the last of which will take it to within just 235 miles (378 km) of the dwarf planet's surface — until June 2016, when the mission is scheduled to end.